Review by AllTheBestFights.com: 2017-02-19, some good exchanges between Santiago Ponzinibbio and Nordine Taleb but it is not enough to get three stars: it gets two. The black belt in Bjj Santiago Ponzinibbio entered this fight with a pro mma record of 23-3-0 (83% finishing rate) and he is ranked as the No.32 welterweight in the world. He lost to Lorenz Larkin in 2015 (=Larkin vs Ponzinibbio) but then he has won over Andreas Stahl, Court McGee and Zak Cummings (=Ponzinibbio vs Cummings). His opponent, Nordine Taleb, has a record of 12-3-0 (50% ko/tko victory rate – he has never won via submission) and he entered as the No.39 in the same weight class. He was defeated by Warlley Alves in 2015 but he came back to win in 2016 against Erick Silva. 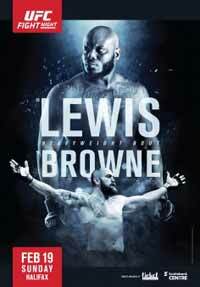 Santiago Ponzinibbio vs Nordine Taleb is on the undercard of Derrick Lewis vs Travis Browne – UFC Fight Night 105. Watch the video and rate this fight!